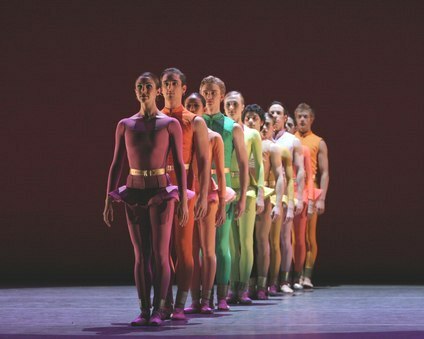 Apollo (1943): Choreography by George Balanchine, Stages by Richard Tanner, Music by Igor Stravinsky, Original Lighting by Ronald Bates, Lighting Re-Created by Brad Fields, Conductor: Charles Barker, Performed by Jose Manuel Carreño as Apollo, Julie Kent as Terpsichore, Irina Dvorovenko as Polyhymnia, Stella Abrera as Calliope, Amanda Cobb as Leto, mother of Apollo, and Adrienne Schulte and Hee Seo as Handmaidens. "Apollo" was first performed by Ballets Russes in 1928 in Paris and by ABT in 1943 in New York City at the Met Opera House. (Program Notes). Although this ballet has been reviewed at NYC Ballet several times in this magazine, tonight's revival seemed a fresh interpretation in terms of the dynamics between Apollo and his three muses and in terms of direct engagement of muse to audience in the solo performances. This Apollo, in signature Carreño hormonal drive, although hardly strict Balanchine style, seemed to look at himself, looking at his muses, while the most melodic of Stravinsky scores played out from Charles Barker's orchestra pit. Julie Kent seemed a bit aloof as Terpsichore, inwardly turned, while Irina Dvorovenko seemed a bit too humorous as Polyhymnia, outwardly turned. It was, however, a perfect balance of self-awareness and connection with Apollo in Stella Abrera's Calliope, as this is certainly a dancer to carefully watch, as she mesmerizes the audience and her partner in every step and glance. The remaining three corps dancers added necessary theatrics and mythological moment to this well-conceived revival. Gong (2001): (See October 19, 2005 Gala Review). Choreography by Mark Morris, Staged by Tina Fehlandt, Music by Colin McPhee (Tabuh-Tabuhan), Costumes by Isaac Mizrahi, Lighting by Michael Chybowski, Costumes executed by Barbara Matera, Pianists: Barbara Bilach and David LaMarche, Conductor: Charles Barker, Performed by Erica Cornejo, Gillian Murphy, Anna Liceica, Xiomara Reyes, Michele Wiles, Herman Cornejo, Grant Delong, Jared Matthews, Sascha Radetsky, Isaac Stappas, and the Company. Tonight's cast was the same as the Opening Night Gala, last week, but the space of time allowed a new look at a current work. I was taken with the two dances to silence, as the two partners must be in sync, minus the musical cues. There are also moments of absence of light, to contrast with those moments of absence of sound, followed by the percussive elements of the pianos, powering the pulsating, ever-changing, and Asian-influenced score. Gong should be seen more often, as, on each viewing, it seemed more and more interesting, highlighted by the brilliantly toned Mizrahi costumes. The Green Table (1932): Choreography by Kurt Jooss, Music by FA Cohen, Costumes by Hein Heckroth, Masks by Hermann Markard, Staging by Anna Markard, Repetiteur: Jeanette Vondersaar, Lighting Re-Created by Kevin Dreyer, Pianists: David LaMarche and Daniel Waite, Performed by David Hallberg, as Death, Patrick Ogle as The Standard Bearer, Jared Matthews as The Young Soldier, Jennifer Alexander as the Young Girl, Carmen Corella as The Woman, Jesus Pastor as The Old Soldier, Marian Butler as The Old Mother, Carlos Lopez as The Profiteer, and the Company as Soldiers, Women, and Gentlemen in Black. This work was influenced by a dance of death and a post-WWI political culture, when it was premiered in Paris in 1932. (Program Notes). I last saw this ballet, also at City Center, but with the Joffrey, when they used to be based in New York, so it had been quite some time; yet, I had always remembered that long green table, at which the politicos of opposite persuasions, in outlandish masks and black tight suits, bent onto elbows and then shot pistols into the air. This classic, ant-war ballet is timeless and timely, and I hope this Company Premiere will be seen often in repertoire. The lead role is that of Death, dramatically portrayed by David Hallberg, of tall stature and muscular limbs. His booted legs have a kick-front, kick-back choreography that perfectly fits the haunting FA Cohen score. Death, in the figure of Mr. Hallberg, devours its prey, and is larger than the soldiers, women, and Patrick Ogle, the racing Standard Bearer. Jesus Pastor is a remarkable Old Soldier, full of energy still, and Marian Butler shows superb dramatic poise as The Old Mother. Carlos Lopez, the Profiteer, is the most thought provoking of the anti-war characters, as it is The Profiteer who usually wins the war, regardless of the ravages of Death. Jared Matthews is a poignant Young Soldier, full of passion and presence, and the Soldiers and Women, danced by the corps, carried the story from mobilization, to combat, to refugees. However, Mr. Hallberg, the startling and immense figure of grey-black Death, with helmet, dark-lined makeup, steel armor, and black designed grey tights, is the one we will remember, as life imitates art, and events unfold on our televisions in a culture of war and conference tables. That long, green table, with Dickensian characters hovering about in self-adulation and miming mockery, will seem more and more like reality in the theatre of current events.